My 3-year-old daughter decided last month that she loves snow. The past couple winters, she was either indifferent to it or annoyed by it. But this year, when the first snowfall came, she was fascinated by the stuff. She was thrilled to discover she could make deep footprints in it, and throw it too! The real delight came, though, when my husband showed her she could EAT it. She put a handful in her mouth, and her eyes widened with excitement as it melted. The scene reminded me of the Israelites encountering the manna in the wilderness–the flaky white stuff that covered the ground each morning, nourishing their bodies and restoring their faith. Unfortunately, feeding my family during the deep midwestern winter isn’t as easy as turning them out to graze on the new snow each morning. And yet, I’m committed to eating in place (i.e., food grown or raised in the region where we live) as much as feasible. I do this for a few reasons: it’s good for the local economy; it “costs” less in terms of fossil fuel resources; and food tastes better and retains more nutrients when consumed closer to the time and place where it grew. There’s a theological reason too. Eating in place connects me to the land where I live–the watershed, the wildlife, and the seasons that animate this particular place on the earth where God has placed me. 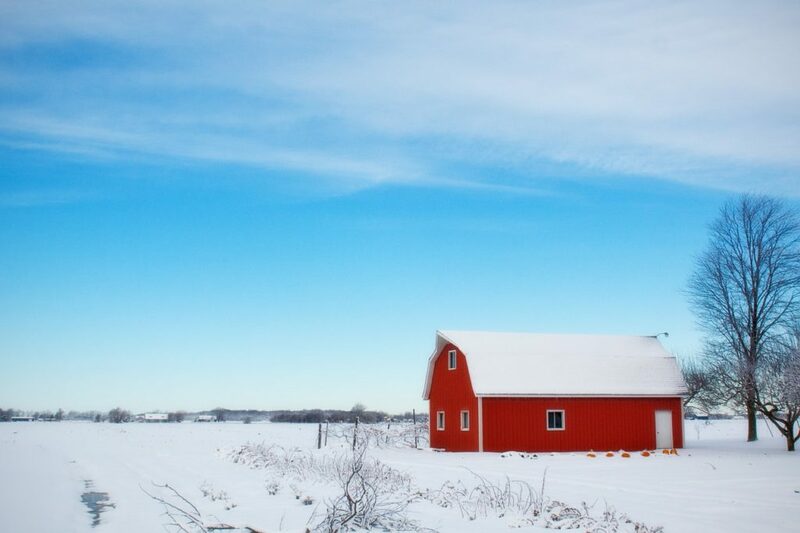 But it’s a commitment that gets trickier to maintain when the farm fields rest under a blanket of snow, and the next farmer’s market is 5 months away. We don’t have time to can like we used to, but we still extend the reach of the summer and fall bounty in the freezer and garage. When crops are at their peak, we buy extra at the farmers’ market, load up some ziploc bags, and stick them in the freezer. When storage crops like carrots, potatoes, and winter squash overtake the market in the fall, we stock up and clear off a shelf in the garage to serve as a makeshift root cellar. (In our old place, it was a corner of the 3-season porch–somewhere cool but not freezing, and without much direct sunlight.) This usually buys us 4-6 weeks of “shelf life” for the veggies. Throughout the winter, we eat from the freezer and garage/porch stash with memory and hope. When we feed the girls frozen blueberries, we remind them of when we bought them on a sunny summer morning. When we eat carrot soup in February, we talk about how, in just a few more weeks, the ground will be soft enough again for the farmers to plant carrot seeds. I don’t know what effect these conversations have on my daughters; but they allow me to rest in the promise of the turning of the seasons. In the winter, when local produce is in short supply, we double down on buying meat, eggs, dairy, and grains from nearby. Our food spending is always a combination deal: in the summer, we supplement bigger farmers market/CSA spending with grocery store staples; in winter, we spend more on local proteins and grains, and supplement with some grocery store produce. This year, our Advent was deeply enriched by a new book called All Creation Waits. Author Gayle Boss describes how 24 different native animals prepare for and endure the harsh midwestern winter. With Advent now in the rear-view mirror, I find myself still heeding the testimony of fellow creatures who eat and live in place these dark months without the (petroleum-based) resources we humans have. I learned how the painted turtle actually stops breathing for months, burrowing herself into the mud until spring comes. How might I slow my breath and pause this winter? And what will I hear if I do? I learned how the black bear hibernates, even through the process of birthing and nursing her cubs. What would it look like to yield myself to the natural rhythms of God’s order this year? I learned how both the common garter snake and the striped skunk eschew their usual preference for solitary living and seek the warmth and protection of community to survive the winter. How does my community keep me alive? Perhaps I can honor that truth by sharing more meals this winter with the ones who sustain me. Praise God for the winter. It’s harsh; but it is essential for the rejuvenation of the land and her people. As I pay attention to its limits, I learn the lessons it has to teach me. Does winter change your eating habits? How? Beautifully expressed useful thinking, thank you so much! Thank you, Nadia , for reminding me of my connection to our mother earth. You message left me with a feeling of calm.